This 48-in. Front Blade is compatible with Select SeriesTM X500, X520, X534, and X540 Multi-TerrainTM Tractors. This blade package also comes with new 50 LB plastic rear wheel weights and a new set of tire chains. This item is not available for 2nd day or next day shipping. UPS ground shipping only. Please allow 10 to 15 business days for delivery. Blade is constructed of heavy .12-in. thick steel. A reinforcing angle behind blade gives extra strength at the working edge. Blade cutting edge is made from hardened steel and is replaceable. Two large coil springs hold the blade in a vertical working position. Bottom edge will be pushed back if a solid object is struck. Blade can be locked in the vertical position if desired. Great set up for moving snow! Excellent quality kit. Installation not all that difficult. Not a big fan of the attachment supplied for the wheel weights though. It consists of a long threaded rod and on my X534 the ends just stuck out too far beyond the weight. Ended up getting some 1/2 x 8" carriage bolts and using them instead. When ordering be sure to specify what model and tire size on your machine. My kit shipped with the wrong size chains for my tires. The Green Dealer quickly shipped the correct replacements and all is well. Next purchase will be the remote angle kit. 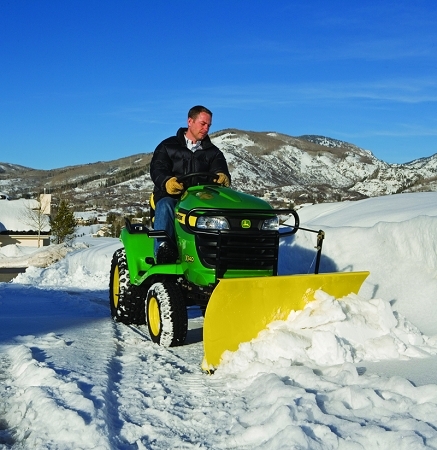 You will be happy with this kit to move snow!!! very pleased with delivery and price. shipping cost was $100.00 less than competitor. Installation was not to bad. I would highly recommend this site and all my future J deere parts will come from here. Great job Guys!